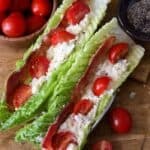 BLT Egg Salad Lettuce Wraps are a simple and satisfying snack or lunch! 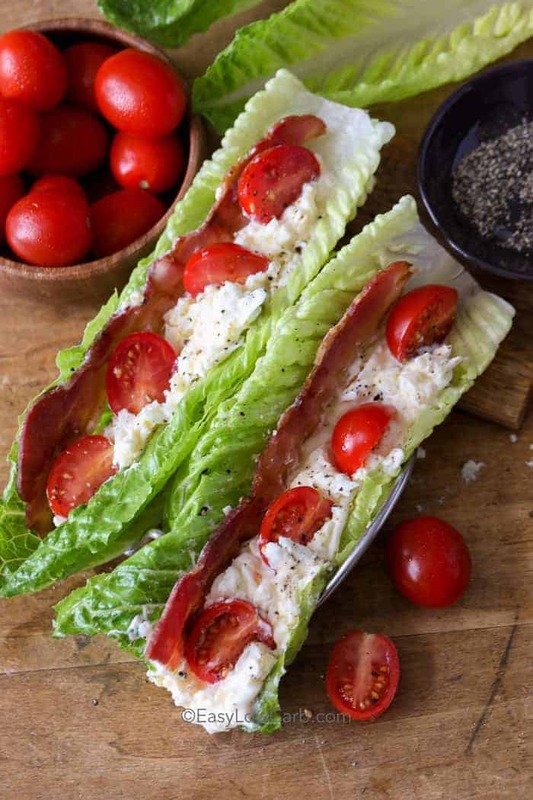 Creamy egg salad, smoky bacon and ripe tomatoes are nestled in crisp lettuce leaves for the perfect satisfying bite! Add in some diced pickles, a dash of mustard or a touch of hot sauce for extra flavor! I love a good egg salad sandwich! As much as I love it bread is off my list now so I have been putting it on a bed of lettuce or just eating it right out of the bowl. Since it’s summer, I love to find new ways to enjoy fresh veggies and cool refreshing meals on the go. Every week I make up a huge batch of hard boiled eggs so I always have something to grab and go, no snack excuses! I’ve almost always got a ziploc bag with a boiled egg in my purse (hoping I never forget it there). Having hard boiled eggs on hand also makes it super simple to make egg salad really quickly. This easy recipe starts with a simple and traditional egg salad. While it’s pretty standard, you can add in some diced pickles, hot sauce or a dash of mustard. For the bacon, you can certainly use real bacon cooked from raw but I like the precooked bacon because it’s just a few seconds in the microwave and mess free. I find romaine hearts hold up well, but you can use whatever you have in your fridge. Should you choose butter lettuce, double stack the leaves as they are fairly fragile and may break. I love using simple iceberg lettuce for lots of crunch too! 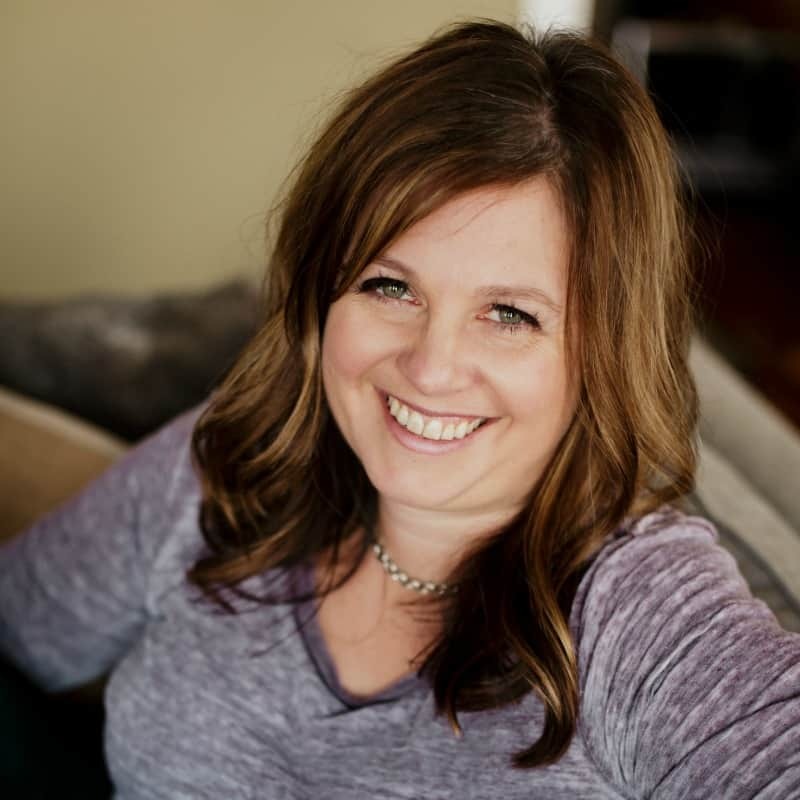 To cook the perfect hard boiled egg, I love to use my instant pot! You never have a dark ring around the yolk and the shells literally slide right off! Grating the eggs on a cheese grater gives you extra fluffy egg salad, perfect for piling high in lettuce leaves! 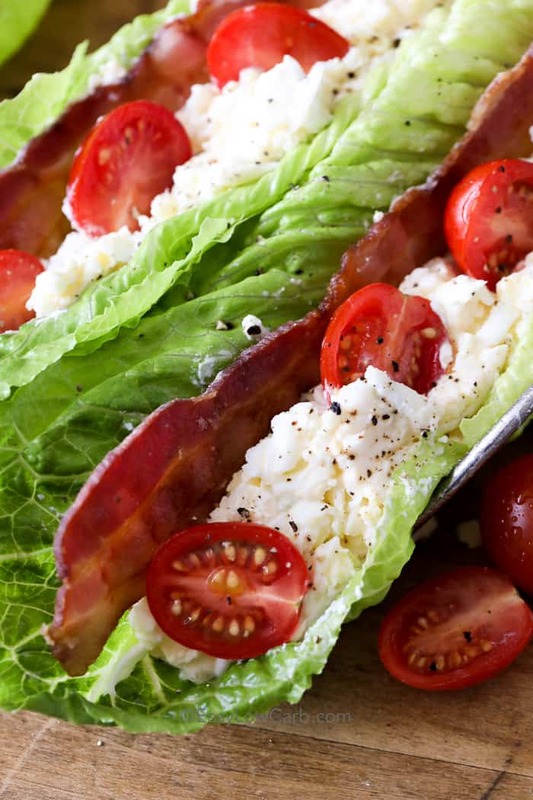 Creamy egg salad, smoky bacon and juicy tomatoes in a deliciously crisp lettuce leaf. Shred hard boiled eggs using a large cheese grater (or chop with a knife). Combine eggs, mayonnaise, green onion, seasoning salt & pepper. Place 1 slice of bacon in each lettuce leaf. Divide egg mixture over romaine leaves. Top with tomatoes and additional salt & pepper if desired. Nutrition information calculated with precooked bacon. 1 serving is 3 lettuce wraps. The lettuce may become limp and soggy, I would suggest keeping a paper towel over them or assembling them the same day.